York Nordic poles are a unique set of walking poles that combine high quality engineering with elegant design. These three piece adjustable poles are made from high grade aluminum and feature stylish designs. The poles adjust easily using our exclusive flip locks that quickly snap (and stay) in place. All poles comes with a screw on basket for skiing snowboarding and sand walking. They have a solid tungsten steel tip. We've even included detachable rubber feet; perfect for street walking. The Cushion Black Grip Handles are perfect for the power user. 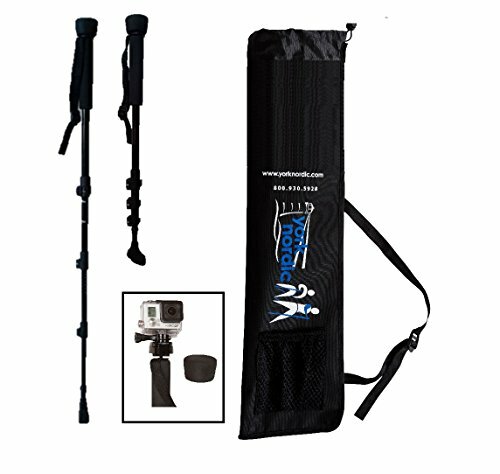 The top of the pole has a removable top that has reveals a screw top to mount any standard digital camera including GoPro models with a standard camera mount, perfect for snowboarding, skiing, fishing, hiking, or hunting . Nordic Walking is easy to learn and best of all it combines fun and with convenience. Every order includes a free access to an online Nordic Walking community with free instructional videos. Nordic Walking is like fitness walking with specialized walking poles. Nordic Walking is perfect for all ages and abilities. Nordic Walking burns up to 40% more calories, increases upper body strength, improves balance, and reduces stress on your hips, knees and spine. Every set of poles comes with a 5 year guarantee. The Company was founded by certified Nordic walking instructor Lauren DeLong. Based on the seacoast of New England, the Company combines world class sports engineering with the unique design styles of our artists. All products are designed in the US with component fabrication in the US and China. Final assembly is done in Portsmouth, NH. Complete Set: Include 2 poles with grips and camera mount, detachable rubber feet with tungsten steel tip underneath. Screw on snow baskets. Compare our quality and warranty to anyone - Black Diamond, Leki, Cane, Komperdell, Rei, 100% carbon fiber, Paria, Hunger Hiker, Montem, Cascade Mountain, Mountainsmith, BAFX, Foxelli, Bangail, TrailBuddy, Yukon or any walking pole or hiking stick. Nobody has a better warranty, service, or product support! From York Nordic: Best in Industry 5 year warranty, Free access to training videos. York Nordic - Passionate about walking, hiking, and just getting out there! View More In Trekking Poles. If you have any questions about this product by York Nordic, contact us by completing and submitting the form below. If you are looking for a specif part number, please include it with your message. SE WS627-50 Wooden Walking/Hiking Stick with Hand-Carved Flower Design, 50"
SE WS629-60 Natural Wood Walking Stick with Steel Spike and Metal-Reinforced Tip Cover, 60"
SE WS631-51RH Survivor Series Hiking/Walking Stick with Root Head, Carved Design and Steel Spike, 55"
SE WS630-40 Natural Wood Walking Stick with Steel Spike and Metal-Reinforced Tip Cover, 40"